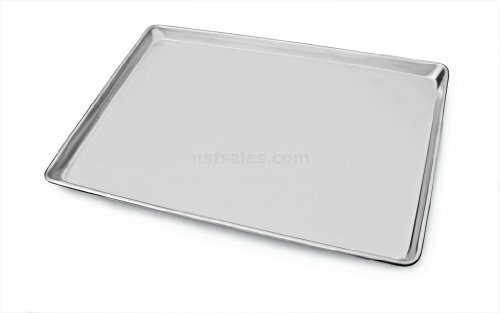 QUALITY- Commercial grade, 18-gauge bakeware is made of pure aluminum which will never rust for a lifetime of durability. DURABILITY- Wire reinforced beaded rim helps prevent warping. Baked goods rise and bake evenly due to aluminum's superior heat conductivity. MULTI USE- More than a sheet pan, use for your cinnamon rolls, sticky buns, yeast rolls, brownies, corn bread, cookies and fruit cobblers. SIZE - Measures approximately 18 x 26 inch. Also available in Quarter, Half and Two-Thirds Size.